Deep in the middle of the gooiest, brownest, slimiest pit of mud there ever was, sat Cedric, the pig. Oh how he loved the mud. He was the happiest when he had mud thickly coated over his hide. When the other pigs came by and wanted to lie in the mud, they had to push Cedric out of the way to make space for themselves. He loved the mud so much that he would lie in it all day long, stretched out and comfortable. 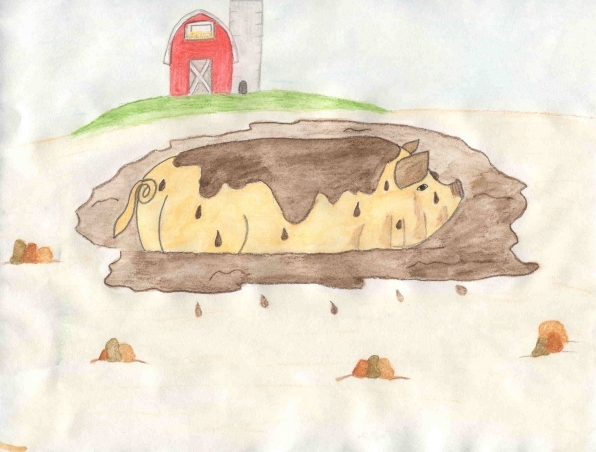 None of the other pigs had ever seen Cedric out of the mud pit. They often wondered when he ate and drank. Little did they know that he always went out at night, when all the other pigs were sleeping, so that none of them would try to take his place in the mud while he was gone. He made sure that he ate and drank enough to last until the following night. One day it rained for hours. It wouldn’t stop. The mud pit turned into a big puddle. It didn’t feel soft and gooey to Cedric; it felt like runny muck. Seeing that all the pigs were inside the pen and that he wouldn’t lose his place in the mud, he went for a walk. It kept on raining and each drop of rain washed a little bit of the mud off of him. After a while there wasn’t one drop of mud left on Cedric. He was a clean pig. He continued to walk for another hour or two. When it finally stopped raining, he headed back to the mud pit. By the time he got there, the other pigs were coming out of the pen. They were all staring at him. He grunted and oinked but they kept on staring and whispering things as he walked past. "Oink. Who are you?" asked Patrick, the biggest pig. "What are you doing in our pig sty?" Cedric looked at him. "Patrick? It’s me, Cedric," he answered. The other pigs came running to see. "That’s not Cedric," one said. "Cedric? Oh sure!" said another. "It’s me! I’m Cedric," he cried out. "Cedric is in the mud pit. He never ever comes out," Patrick said. "And his skin is not pink. It’s brown!" another pig added. "Just follow me," Cedric ordered. The group of pigs followed him to the mud pit. There was no pig in it. Cedric ran and jumped in. Mud flew into the air and landed on all the other pigs. It splattered on the ground and ran into Cedric’s ears. He rolled around in it and stretched out his body. "Why, it is Cedric," Patrick oinked. Just then a beautiful rainbow came out from behind the clouds. It shone yellow, red, pink, blue, purple, green, and orange. They all looked up at it, all except Cedric. His eyes were shut. He was asleep, snoring happily away in his mud pit.